Glaro modular wall mounted coat racks and shelving are the most durable, functional, and versatile products of their kind. Add these wall mounted coat racks and storage shelving units to any type of wall construction, converting non-functional space into efficient storage. Glaro wall mounted coat racks and shelving are popular because of their multi-purpose modular design. Every establishment can benefit from these handsome wall mounted coat racks and shelving units. Professionals recognize the outstanding quality and attractive design of these modular wall mounted coat racks and shelving that are made in the USA and are built to last a lifetime. Glaro’s craftsmen have designed and perfected these wall mounted coat racks and shelving over the years. The unique modular construction allows the wall mounted coat racks and shelving to be ordered in almost any length because they are constructed with more than one interlocking section. Extended lengths can be composed by interlocking single 24”, 30”, and 36”, sections with support brackets at the intersections. 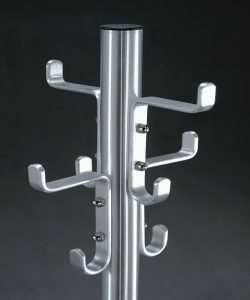 Add the matching solid aluminum coat hangers to complete your system. 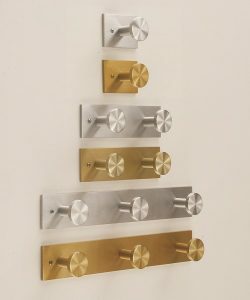 Glaro wall mounted coat racks and shelving are made in the USA and are in stock for immediate shipping. 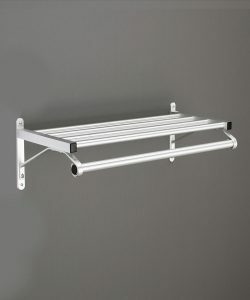 These handsome modular wall mounted coat racks and shelving units are constructed of carefully machined solid aluminum. The heavy gauge rust-proof tubular design and fine satin finish make these wall racks and shelving extremely durable and will retain their new appearance for years to come. The tubular design helps prevent the collection of dust. Because they are constructed of aluminum the modular wall mounted coat racks and shelving are ideal for humid as well as dry environments. 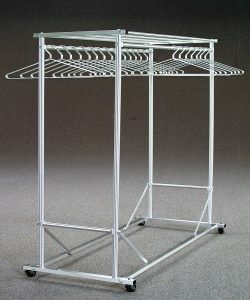 Glaro wardrobe racks are also built from heavy gauge aluminum tubing and are perfect for high profile areas. These functional wardrobe racks cannot rust and may, therefore, be used anywhere. The design and the satin aluminum finish provide a pleasing appearance that blends well with the surrounding fine furnishings. Use Glaro wardrobe racks in hotels, conferences, events, meeting rooms, coat check areas, offices, industrial environments, laundry departments, classrooms, restaurants, funeral homes, or anywhere that people gather. Two inch ball-bearing casters are standard with all Glaro wardrobe racks so they can easily be transported when not in use. Choose from single sided and double sided wardrobe rack models. Matching Glaro coat hangers and umbrella stands are also available. Glaro coat trees, traditionally called “costumers”, were one of Glaro’s original products in 1945 when Glaro was founded. Glaro was the first to replace wood coat trees with tough long lasting aluminum models constructed from surplus World War II stretcher poles. The Glaro aluminum coat tree was an immediate success. Attractive Glaro coat trees continue to lead the market. With heavy weighted bases for stability, double capacity hooks, bright satin polished aluminum, satin brass, and 29 powder coated colors, Glaro coat trees continue to satisfy designer’s preferences. Made in the USA, these sophisticated coat trees are considered a standard for professionals anywhere. Glaro coat hooks are perhaps the most durable solid aluminum hooks found anywhere. Eye catching single, double, and triple coat hooks and hook strips are always in stock. Rust proof satin aluminum and tarnish-proof satin brass hooks are hand finished to perfection, can support the heaviest clothing, and provide an attractive solution for clothing storage in restaurants, hotel rooms, offices, schools, health clubs, rest rooms, waiting rooms, ships, and residences. 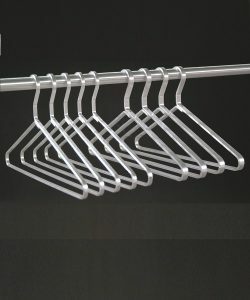 Solid extra heavy duty aluminum coat hangers are permanently riveted to insure a permanent connection to close the triangular shape. The heavy gauge aluminum insures that the hangers will maintain their shape even when used with heavy clothing and uniforms year after year. The satin aluminum finish on these handsome coat hangers makes them a perfect match for all Glaro coat hanging modular wall racks, wardrobe racks, coat trees, and hooks.